A recipient of the Presidential Medal Of Freedom, and a (George Foster), Peabody Award in 1987, he was also inducted into the Television Hall of Fame. One of his sweaters is even in the Smithsonian! OK, how many of us admit to growing up and siting on the floor of the living room watching him when we were little kids? I know I did, and wouldn't miss it, along with Sesame Street and maybe Zoom. Ah, the golden age of PBS. 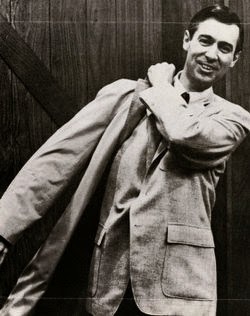 Fred Rodgers was a native of Latrobe, PA, graduating from High School there in 1946. He began playing the piano at five. Fred earned a BA in music at Rollins College and married in 1952. In 1953 he graduated from the Pittsburgh Theological Seminary. Rodgers then dividing his time between New York and Massachusetts. He worked for NBC by 1951, but found the commercialism limited his creativity, and quit. So, by 1954 was hired for the Children's Corner and the Canadian Broadcasting Corporation, where with Josie Carey of Butler PA, he wrote songs, then later in 1963 with the Canadian Broadcasting Corporation and for WQED as a puppeteer in 1966. That is when the show went to half hour installments. He started with Curious X the Owl, King Friday the XIII, Henrietta Pussycat and Daniel the Striped Tiger. He began wearing the sneakers to keep down any scuffling noises on the live sets. The red and yellow trolley was famous for the break segmenting from the 'house' to the 'neighborhood' and back again. There in Pittsburgh, Pennsylvania, he found a home and an outlet for himself that he was happy with and brought much joy to kids over quite a few years. The show began locally in 1963 and went national by 1968. He advocated for public funding before the United States Senate. He received four, count them!, four Emmy's and a Lifetime Achievement Award in 1997 when he was Pittsburgher of the Year and has his own star on the Hollywood Walk of Fame. He accomplished this cultural influence and affectionate appeal for all of thirty eight years of fantasy and...his 'neighborhood of make-believe' which in childhood, was also ours. Mr. Fred Rodger's passed on in 2003 and is buried at Unity Cemetery in his hometown of Latrobe. Another Latrobe, Pennsylvania native, modestly born on September 10, 1929 was a charismatic and friendly professional golfer. He became one of the greatest golfers the world has ever seen, in the days of Gary Player and Jack Nicolaus. He is well known as an affable person and a chancy and exciting player. Nicknamed 'the King', Arnold Daniel Palmer was the very first to win the prestigious Masters Tourney four times and had won scholarships as well. He was the early practicing son of a golfer who started out as a greens keeper, Milfred Deacon Palmer, whose ancestors were supposedly from Scotland, (at least according to a classy little old lady who claimed her family were related to him, whom I remember talking to years ago. Anyone that has further info, please contact me by e-mail). It was said he grew up with Fred Rodger's, now imagine that. You have to wonder if they ever played golf together? Well, he certainly played at the Latrobe Country Club, which he bought and redesigned in 1971. 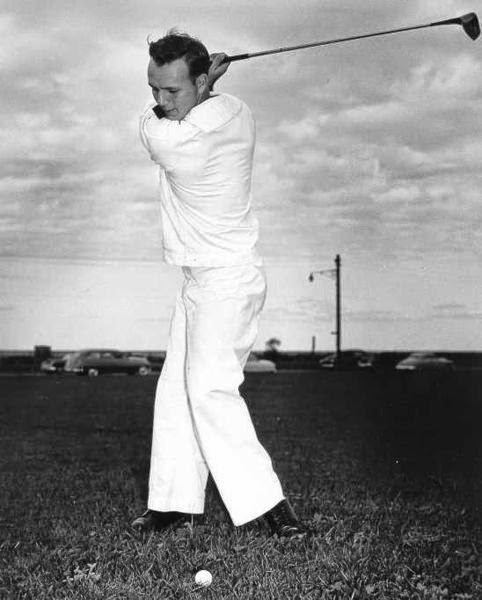 He quit golfing for years and joined the US Coast Guard in the 1950's when close friend, Bud Worsham died suddenly, but he returned in 1954 and turned pro himself. In 1955 he won the Canadian Open. For Arnie, there was no going back, with his popularity and skill. He was known as the world's best golfer from 1960-63 and was personal friends and golf buddy with none other than Dwight D. Eisenhower, a five star general and the 34th President of these United States, from1953-1961. Arnold also did quite well on the Senior circuit. In 1979, a good year, he was inducted into the World Golf Hall Of Fame, a proud moment. Over the years he became an amazingly successful businessman with automobiles and airplane companies and a great pitch man of commercials for many products as well. Arnold was probably the most famous golfer of all time, even beyond the par 5 heights of old veterans like Sam Snead and Ben Hogan. He also owns the Bay Hill Club and Lodge in Orlando, Florida, and hosts the Arnold Palmer Invitational every year since 1979. There is a drink named after him too, the 'Arnold Palmer', a mix of ice tea and lemonade. Arnold was awarded the Presidential Medal of Freedom in 2004. Since 1999 the Arnold Palmer Regional Airport was named in his honor. Latrobe has interesting roots for its heritage and is named after the B & O's chief engineer Benjamin Latrobe II, designer of the unique Thomas Viaduct near Elkridge, Maryland. It was built in the mid-1830's and was the largest bridge in the U. S. Many people probably aren't aware that his famous father, Benjamin Henry Latrobe, 'the father of American Architecture', was a friend of Thomas Jefferson and he visited Mt. Vernon as a personal friend of Bushrod Washington, George Washington's nephew of Westmoreland County, Virginia, who also inherited the estate. Latrobe Sr. who designed the Bank of Pennsylvania, and the White House portico's, was one of the main architects of the United States Capitol on the National Mall in Washington, D. C, especially as to the rebuilding in 1815. Latrobe in Westmoreland County is the home of the Latrobe Brewing Company, founded in 1893 which made the Rolling Rock beer label and purchased by LaBatt in 1987 and eventually becoming a subsidiary of Aneuser-Busch and InBev. In 2009 it began bottling for Iron City. They are also brewing Duquesne Beer. The city which was laid out by Oliver Barnes of the PA Railroad and incorporated as a Borough in 1854, was also home to international trumpeter Dennis Ferry and Boniface Wimmer, the founder of Saint Vincent's Archabbey and College in 1846, the oldest Benedictine monastery in the United States. By the way the Archabbey Gristmill has a Facebook page. Yes, St Vincent's hosts the Chuck Noll Field and since 1966 is the training camp of the Pittsburgh Steelers. As well as the home of the Banana Split, invented by David Strickler in 1904. This was the location of the Ligonier Valley Railroad going back to 1853 on Loyalhanna Creek and owned by the Mellon banking family. "In a bizarre story during that final season, the "California (Pennsylvania) YMCA team" came to Latrobe for a game, and was ejected from its rooms at the Parker House for "chasing and frightening a chambermaid," jumping on beds and breaking two of them, and for language "far from what might be asked for from YMCA boys." Latrobe would go on to win the game, 38–0, in front of a small crowd. However, it was later discovered that there wasn't a YMCA located in California. Who Latrobe played in that game remains a mystery". For those wanting more details of the games, here's a link to an in-depth PDF article by Robert B. Van Atta. A future post with extra material is a possibility, though more history will be included in an upcoming post on Fort Ligonier. Here's to Fred Rodger's and Arnold Palmer, two wonderful Americans, Pennsylvanians and natives of our local region! Apparently the 'kaptcha' deters some of the folks which is unfortunate. I receive some comments through e-mail. Thanks though for YOUR comments and appreciation, it means so much! I'm happy to hear you like the Latrobe post. The website requires so many hours a week, maybe 10-15 or so, but I've learned to keep a ways ahead with what is planned. In answer to your question of a forum, that would be no. It doesn't seem something I would attempt now unless there are a certain amount of concerned people that let me know they want to participate. Saying that, I really think it would be an interesting idea if we got the home ground support here. And the ads are something I've considered and wouldn't rule it out completely. The site surely looks better and less cluttered this way.